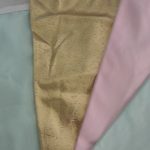 Double sided hemmed bunting in green, pink and gold. Each section is 11m in length. 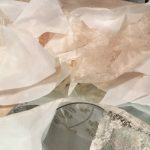 Single layer cream (ivory) cotton and lace bunting. Two lengths available of 11.5m and 8m. Hire charge is £5 per length. 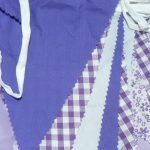 Cotton bunting in purple and lilac, floral and chequered. Single layer with zig zag edge. 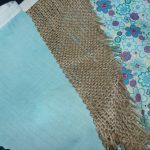 Cotton bunting in Hessian and Turquoise (plain and floral). Single layer with zig zag edge. Each length is 12 metres long (4 available).